The following is essentially an unpaid commercial for something I think is pretty sweet. Update 2: I have decided I will continue to update the code list day to day, at least until I complete all of my sets, look to the BOTTOM of the post for the latest! 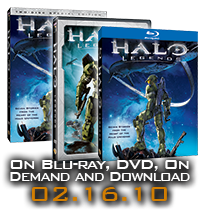 Have you been following the news about the Halo Legends DVD and Blu-Ray coming soon? I’m a huge sucker for a good story, I love single player video games and their campaigns, I do enjoy the backstory of the Halo universe. In the new tradition, popularized by The Animatrix, Halo Legends will fill in a great deal of Halo lore via anime short films. To celebrate the release on February 16th, 343Industries is putting on a contest, hosted as a Facebook App. You could win everything from an Xbox 360 to copies of the movie, and Grand Prize even gets a trip for two to see 343 Industries HQ (the new home of all things Halo). To sign up, you can just visit HLSweeps.com. To earn sweepstakes entries, all you need to do is enter the daily codes – doing so can also unlock some very hi-resolution artwork and a trailer for the Halo Legends DVD & Blu-Ray. You earn these nice little achievement bonuses by collecting the “cards” given to you with each code entered. 1 sweepstakes entry & 2 “cards” per code. If the left side of the sweepstakes page doesn’t reflect 32 entries when you’re done with what’s below, you missed something, so try a few more! Get started entering codes on the Facebook app page, and visit HLSweeps.com each day to continue entering them! The gaming element of the page will also reflect cards which you have “multiples” of – if you want to unlock the high resolution art or the preview video by collecting these cards, you can trade with other “collectors.” To send a card to a friend, just click the “SEND” button beneath a picture – a window will open asking you to begin typing your friend’s name and you can send away – the person must be on your friends list to send or receive cards from them. I happen to need 5 cards to complete my set: 2, 29, 30, 40, and 48 – feel free to help me out by adding me as your Facebook friend! So start entering those codes on HLSweeps.com! Posted in Gaming, XboxTagged HDvsBluRay, xbox 3602 Comments on [update 2] Halo Legends Sweepstakes (sorta) has achievements! Alright folks, now we’re hearing that Microsoft has confirmed support for BluRay. Does that mean we’re getting a BluRay add on for the Xbox 360? NO! That has yet to be confirmed, no matter what carefully worded statements from Microsoft may have you believe. The quote is that Microsoft, as a company, are working on “device driver support for Blu-ray drives and the like.” It’s called Windows Plug’n’Play, folks. When you buy a new CD Burner for your computer, it’s hard for them to give you a CD-ROM with the drivers on it so you can install it – certain things need to work wout of the box. BluRay drives and BluRay burners will inevitably end up on the PC, supporting them is a must for Microsoft. But not a necessity for the Xbox. Microsoft is a large company with a lot going on – they need to keep ahead of BluRay development, but not specifically for the benefit of their Xbox devision. Microsoft’s answer to BluRay is the Xbox Live Video Marketplace, #2 only to iTunes (which can be installed on literally BILLIONS of computers, instead of just MILLIONS of Xboxes, so I think the #2 seat seems pretty cushy). To the naysayers that say the Xbox 360 can’t survive without BluRay support, I encourage them to stick around. It’s a gaming console first, and a home entertainment unit second. Sales of Halo 3 should attest to that, as well as the power of video games over the power of movies. If a BluRay add on drive makes its way to the 360, good for it, but I hope nobody is holding their breath… they just might go Blu before Microsoft does! Financial Times, GlobeandMail, EETimes, PC World, Wired, BetaNews… you get the picture… EVERYONE is talking about the idea that Microsoft and Sony are in talks to offer a BluRay add on for the Xbox 360. While I don’t doubt the validity, I honestly doubt that it will happen. You see, Sony will essentially be able to control the price, based on how they offer it to Microsoft. Doing so, they will be able to ensure that the combined cost of the 360 and a Blu Ray player will exceed that of the Playstation 3, which, as we all know, has the ability to play Blu Ray movies out of the box. The only thing Microsoft could truly do to that end is not only minimize, but NEGATE their profits (take a loss on every BluRay add on sold)… while this would give them higher sales numbers, it’s quite an expensive thing to do just for bragging rights (expensive, mind you, does not mean out of Microsoft’s reach).